Every long-distance and long-term sailor has a budget—big or small. We all travel the world, witness beautiful sunsets, and spend time hanging out in stunning bays. The difference between budgets is chalked up, mostly, to lifestyle. Therefore, sailor budgets vary widely from person to person, allowing us to tailor finances to meet our specific needs. Before you set sail, however, you should have a rough idea of how much money you’ll spend each month. Here’s what you need to consider before casting off. Mooring and Marina Fees—Staying in marinas affords a lot of convenience. You’ll have easy access to showers, laundry services, and restaurants. However, the most time you spend in marinas, the higher your bottom line will have to be. Marina fees vary widely based on the location and the size of your boat. You should anticipate spending anywhere from $20 to $350 each night. Look for prices in the areas you’re visiting before setting off. Food—If you don’t spend a lot of time in marinas, food will be your biggest expense. The easiest way to cut down is to eat on board as much as possible. This will also help you budget—estimating grocery expenses is a lot easier than trying to predict restaurant bills. Water—If you have a watermaker, this won’t apply to you. Water is generally available free of charge, but some marinas will charge you by the liter. The typical price will be around $0.30/liter, but be smart about it. Look for campsites and quays as much as possible. Fuel—You’ll need to fuel your boat engine and outboard (if you have one), and how much you spend on these is ultimately up to you and personal preference. How quickly do you want to travel? Are you comfortable sailing for the majority of your adventure? Do you row or use the outboard when riding your dinghy? These factors will determine how much fuel you’ll need. Phone Bills—Long-distance trips necessitate connection to the outside world. Often, the best and most affordable option will be a phone plan. Phone usage will vary by carrier and location, but aim for around $30-$45 per month. More and more recreational sailors are turning to exploration. Whether you’re thinking about sailing down the coast or across an ocean, you’ll likely bump up against some budgetary constraints. However, if you choose your cruising grounds carefully and are willing to adapt, sailing around the world can be significantly cheaper than simply living on land. With careful planning, most people can do this type of adventuring long-term. In the meantime, here are a few tips for cutting costs. Get a simple boat. Don’t fall for the luxuries of huge, modern sailboats. Instead, buy a simple little boat that is easy to maintain. The fewer things that can break, the easier and cheaper it will be to live aboard. Simple systems, such as manual foot pumps for water and a composting toilet, take much less effort and money to look after. Smaller vessels are also less expensive to store, paint, and heat. Anchor as much as possible. Anchor out as much as you can. This will save you a lot of money on mooring costs, which are often relatively high in popular cruising areas. What’s the point of living on a boat if you have to pay $100 per night to moor? However, you’ll want to keep some extra mooring money on-hand in case of storms or high winds. Research ahead of time. There’s nothing worse than unforeseen costs—especially when you’re out on the water. If you’re planning to visit certain areas, research the countries and ports you want to visit before dropping anchor. This will allow you to account for most expenses in advance. Make sure you check the cost of living in the area, too, because you’ll need to stock up on supplies. Cook as much as possible. Eating on shore is a great way to blow through your savings within the first couple of weeks. Instead, eat on the boat as much as you can. Additionally, consider swapping expensive habits for cheaper alternatives—swap your wine for canned beer, or consume less meat. Save onshore dinners for special occasions. If you spend extended periods of time on a sailboat, being able to get online is crucial. It’s important for navigation, passage planning, weather forecasting, looking for the nearest grocery store, and staying in touch with friends and family on land. The good news is: if you’re sailing relatively close to the coast, getting online shouldn’t be too difficult. Mobile networks often have a huge reach, so most long-term sailors will be able to get decent coverage. That said, here are some tips for getting online easily. Use a SIM card and your phone as a hotspot. For long-term sails, use SIM cards with data plans. A mobile network can be fifteen times more powerful than public WiFi; it’s faster, and you’ll be able to save some money. Mobile data is often cheaper than spending time at an onshore bar or café, plus it’s a lot more convenient. Google Project Fi. If you’re in the market for a new smartphone, see if you can get a Fi-ready Google phone. This project allows people to use one SIM card worldwide and change the data plan based on travel needs. Some people swear by it. Apple SIM. While more expensive, the Apple SIM is usable in 180 countries. Users buy local data plans directly from the iPad. Unfortunately, this is not an option within most sailors’ budgets, but some people who live on their boats love it. It saves a lot of time and the effort of going to shore to purchase SIM cards in each country. WiFi Boosters. Some budget-conscious sailors might choose to keep their mobile plan costs as low as possible. The best way to do this? WiFi boosters. These are small boxes that you can mount to your mast, backstays, or spreaders that catch shore WiFi directly from the boat. Before giving this option a shot, understand that it only works well in populated areas and that you’ll need to choose your anchoring spot based on the WiFi signal. Navigation is often one of the most feared aspects of sailing. If you are out in open water, understanding direction can be a dizzying process. Before gearing up for an adventure, you should learn basic navigation skills—reading a chart, plotting a course, and steering accurately by compass. Once you start sailing on your own, you should assemble a kit with essential navigation tools. This will be especially helpful if you are planning to rent boats—few rentals have navigation equipment (other than a potential built-in compass), so you should always bring your own. Below is our recommended list of tools and equipment to keep in your navigation kit. A hand-bearing compass. This simple compass is fitted with a sight. To use, you point it at an object and read the direction to that object off the compass. Take bearings of two or more objects, plot them on your chart, and find your location by seeing where the lines cross. This is a great way to check your location if you do not have expensive technical equipment. However, this strategy does not work well for open water. Parallel rules. This tool is two rulers hinged together so that they remain parallel with the distance between them is adjusted. Before your trip, use the rules to determine the latitude and longitude of key locations—where you’re sailing from, where you might want to go, and your destination. Write these on the chart and draw lines between key points. A chart of the area you’ll be sailing. At this point, we’ve mentioned a chart two time. Purchase a waterproof chart in the largest scale you can find. This will cover a small geographical area with a lot of detail. If you have a marina membership, you may have access to this tool for free. If you plan to sail the same area multiple times, use a plastic or laminated copy and work with dry erase markers. A handheld GPS. This tool will help determine where you are and how far away your destination will be. This should be your primary method of navigation. However, it is essential to have the other items in this kit in case your GPS fails or breaks during the trip. A handheld marine VHF radio. VHF is the fastest way to get help in the case of an emergency. The Coast Guard, marine patrol, the harbormaster, and other authorities monitor VHF channel 16. This is also a great tool for receiving weather reports and forecasts. A basic waterproof model is relatively inexpensive but be sure to keep replacement batteries on board. Always replace your batteries before a long trip. Though sailing might be considered an individual or partnered sport, the water is open to both professional and recreational boaters. 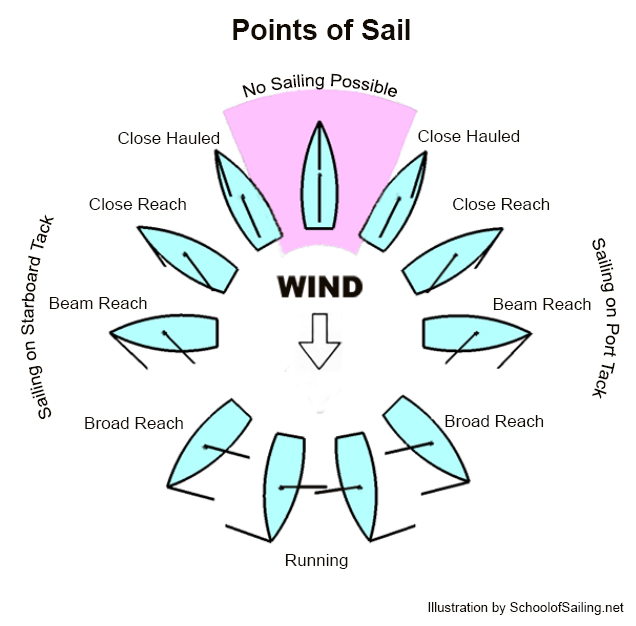 Understanding the basics of the sport requires sailors to familiarize themselves with essential right-of-way sailing rules. It is necessary to remember that sailboats have different right-of-way and codes of conduct than powerboats. Below, we have reviewed the essential basic sailing rules based on the International Regulations for Avoiding Collisions at Sea. Maintain a proper lookout. Use sight and hearing to avoid colliding with other boats. Maintain a safe speed at all times. This will allow you to remain in control of your boat and prevent collisions if you are taken by surprise. Use common sense to assess the risk of collision. If other boats are near or around you, assess the situation to determine an appropriate speed and movement strategy. Port tack gives way to starboard tack. If two sailboats are approaching each other and the wind is on a different side of each boat, the sailboat who has wind on the port side must always give right of way to the other. For example, if wind is coming from the East and one boat is sailing North while another is sailing South, the boat sailing South must heed to the other. Windward gives way to leeward. If two sailboats are approaching each other and with wind is on the same side, the vessel to windward (the direction of the wind) must give way to the vessel which is leeward. If you are at risk of colliding with another vessel, whichever boat has the other boat on its starboard side must yield right of way. If your boat overtakes another vessel, you should keep out of the way of that vessel. Sailboats should always keep out of the way of any boat that is not under command, restricted by its ability to move and maneuver, and/or engaged in fishing. When passing through a narrow channel, keep as close to the outer edge as possible. Non-commercial powerboats must give way to sailboats unless the sailboat is overtaking the vessel. However, sailboats should try to stay out of the way of large vessels and ferryboats; these larger ships are more difficult to slow or change direction, especially in narrow channels. While on the water, safety should always be your highest priority. The best way to ensure maximum safety is to obtain the proper certification/licensure and subsequent education. In Massachusetts, all sailors must carry a MA boating license, card, or endorsement. For fast reference, we suggest taking a look at the Massachusetts Boater Safety Handbook. For younger sailors, Massachusetts requires a Boater Education Card; the regulatory authority for all cards and licenses is the Massachusetts Environmental Police Boat and Vehicle Safety Bureau. The card is mandatory for boat operators between the ages of 12 and 17 years. Though there is no age restriction for boat operators, sailors under 12 years of age must operate a boat under the direct, onboard supervision of an adult. In Massachusetts, you must be at least 16 to operate a personal vessel. To obtain a Boater Education Card or small craft license, boaters must complete an educate course and exam approved by the Massachusetts Environmental Police. Similar to a driving class and exam, the course shows students how to operate and maintain boats, explains the legal requirements for boating, and provides protocol for handling emergencies. The classroom education offered by the Massachusetts Environmental Police is between 10-12 spread over a few days or across several weekends. To pass the course, students bust obtain a score of 80% or higher. Once you have obtained this necessary certification and licensure, you are ready to launch. For those who want to race, teach, or gain further accreditation, becoming an ASA Certified sailor is an important step toward pursuing the sport. Having this knowledge and certification will help sailors to be confident and safe on the ocean—whether you are planning to buy your own sailboat or charter a vessel while on vacation. The American Sailing Association provides certification programs for Keelboat Sailing, Small Boat Sailing, and Multihull Sailing. For more information about how to get ASA Certified, see the organization’s website. This is a list of upcoming Massachusetts regattas. It will be updated as races are announced, but if we have left out any important events, please let us know.